How are Rubber Ducks Made? ​Only 250 silver ducks! The first 2 silver ducks across the finish line will win $2,500 each!Your ​Silver Duck can also win the AdironDUCK Race prizes. If your silver duck comes in first in both races, you could also a grand total of $4,500! In honor of our 25th Anniversary AdironDuck Race, we are holding our first ever Silver Duck Dash! For $100, you can be entered into a specialty race within the duck race itself. ​The first and second silver ducks that cross the finish line will win $2,500 for its owner. Additionally, each silver duck is still running in the overall race to win the AdironDUCK Race prizes. 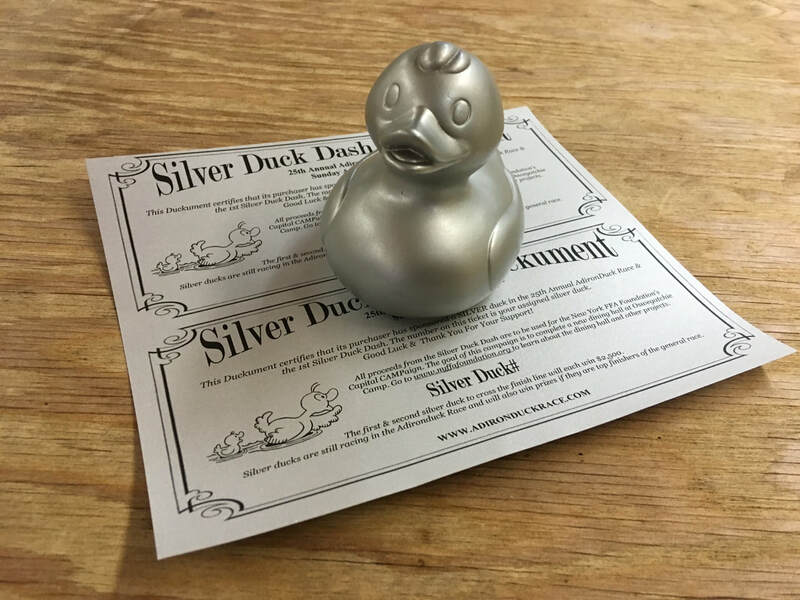 Essentially, if your silver duck comes in first, you could win a grand total of $4,500! All proceeds from this event are being directed to Oswegatchie's Capital CAMPaign to raise funds to help cover construction costs on a new dining hall. Oswegatchie, and its parent organization, the NYS FFA Leadership Training Foundation, Inc. have currently raised $2.6 Million out of the expected $3.3 Million project. It is our hope that the Silver Duck Dash not only helps make the Capital CAMPaign a success, but we pave the way to a better future for all people in the Oswegatchie community. (No FFA Chapter Duck Duck Match). The new dining hall will replace Widrick Lodge with a year round, heated, larger, space that will not only keep our guests safe, but will provide the space we need for our growing camp program. Not only is Oswegatchie used throughout the year by thousands, but the summer camp program is high demand In the summer of 2018, summer camp enrollment was at 844 campers in just 5 weeks of FFA Camp. We have added additional weeks to our season as specialty camps want to use our facility.